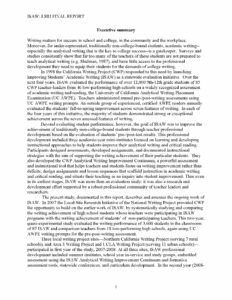 Across both years, students of program participants demonstrated statistically significant improvement in their writing when assessed on both the NWP’s Analytic Writing Continuum and the ISAW Analytical Writing Improvement Continuum. 2008 NWP scores. Across all features of the NWP Analytic Writing Continuum, the interaction between group (program or comparison) and occasion (pre-assessment or post-assessment) was statistically significant (p≤0.05). . . . [T]he difference between gains made by the students of the program participants and those made by the students of the comparison teachers were statistically significant on all six traits assessed on the rubric, along as well as on the holistic score. 2009 NWP scores.…[T]he results from the 2009 NWP scoring also demonstrated statistically significant differences between the program and comparison groups and pre-assessment and post-assessment writing across all features of the rubric (p<0.05).